Rocketry, a 5YO son of Hard Spun and trained by Jimmy Jerkens, worked this morning at Belmont Park in New York. This guy — who has put up a 5-3-2 resume for the first 17 career starts — is coming off a disappointing 5th in the Skip Away Stakes at Gulfstream Park on March 29. But that was his first outing since winning the G2 Marathon Stakes at Churchill Downs to finish the ’18 campaign. This morning, he went 3 furlongs over the dirt training track in :37.77 — which was the 6th best time out of the 8 to go. Just a leg-stretcher. Look for more from this one next time out. By My Standards, winner of the Louisiana Derby last time out for top trainer W. Bret Calhoun, worked at Churchill Downs this morning. The 3YO son of Goldencents went a nice half mile in :48.80 — which was the 12th best time out of the 27 to go that far. It was his second published work under the Twin Spires since he clinched his spot in the starting gate on the First Saturday in May. In his 5 career races to date, this guy has a 2-2-1 mark and has now won 2 in a row going into the biggest race of his career. 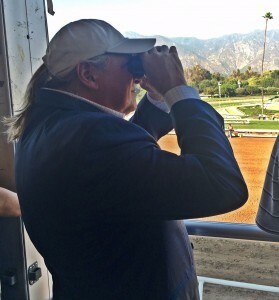 My good friend Ed DeRosa — director of marketing over at www.brisnet.com — loves him. That good enough for you? Bodexpress, runner-up in the Florida Derby last time out and another who has already punched their ticket to the KY Derby field, worked this morning down at the home base of Gulfstream Park West in sunny South Florida. The 3YO son of Bodemeister — who is still a maiden with 3 seconds in 5 career starts — went 5 furlongs in 1:01.20. That was the bullet work out of 5 to go the distance. A maiden win the KY Derby. Been done before. But not in a long, long, long time. Not my money.